Photo Courtesy of Google Images. However, if you are the owner of this one, please let me know so I can give you full credit. Okay, I have to admit to you that this blog is just my all-time favorite. Too bad it hasn't been updated in a while. However, I have found other sources that list more indications of being a Catholic Nerd. One place is Catholic Answers Forum The following are some of my favorites. Please feel free to add to the list. ..your biggest turn on is a man wearing a scapular! ...you know what things Father Hardon says every Catholic should have on them at all times. Actually you get Catholic Nerd status just by knowing who Father Hardon is. ...you feel guilty for missing daily Mass. ...you have a special place for all of your religious art overflow, since there are only so many images of the Virgin Mary one room can handle. ... you get momentarily confused when you hear the word "discernment" referring to something besides trying to determine God's will. ...you know which Eucharistic prayer is being used in 5 words or less. ...BVM and OLOG mean something to you. ...you pick dates for significant events by looking up feast days. ...you have more pictures of saints than of relatives on your walls. ...when problems at work (or in life in general) get out of hand, you go looking for a good novena. 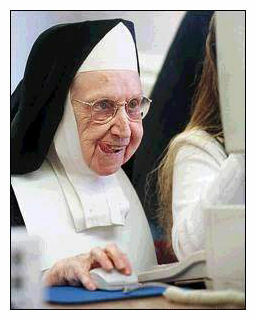 ...somebody tells you they want to be a saint and you take them seriously. ...your daily planner is a "Liturgical Desk Calendar." ...when getting lost while driving, you don't get mad, you say, "well, at least we got to pray the Divine Mercy Chaplet." ...you have images of saints or Jesus stuck to your dash board, or your visor, or hanging from your rear view mirror. ...you own one or more t-shirts that reference the Eucharist, the pope, the Rosary, Confession, or all of the above. ...your children can pronounce and define hypo-static union, ditto for transubstantiation. ....your gauge your movie pix based on their ratings: A-I, A-II, A-III, A-IV and O. ...your emergency kit contains not just duct tape and food bars, but a bottle of holy water, rosaries all around, and medals and prayer cards. ...knowing that a guy or girl goes to daily Mass is a big turn-on. ...the Angelus, rosary, Mass, and/or the liturgy of the hours makes a daily appearance in your life. ...you stereotype people by their apostolate, i.e. Opus Dei, Regnum Christi, etc. ...you receive a invitation to dinner that warns you that it will violate your Friday fast, and so you may wish to choose an alternate fast for that day if you attend. I also visited St. Elizabeth Ann Seton Exchange Blog today and found another interesting entry. This one dealt with the topic of silence. I would advise you to do one thing that may seem to you irrelevant: a silence cure. Try it, and tell me how it works out. Manage to go a few days, a couple of weeks, talking as little as possible. Work silently at the bank, study in silence, and economize on words as much as possible. You will see the effects. Almost immediately you will feel a greater serenity. You will find that you pay attention and see things much more clearly. Words distract a great deal, you can't imagine. You come across men who, to hear them talk, you would say were enemies. And basically they are in agreement without knowing it. Others, on the contrary, talk, thinking that they understand one another, and basically, they continue poles apart. Above all, remember this that I tell you: pay attention. Give your full attention to everything you do, everything you hear. You will discover new worlds. . . . There is no thing or person that cannot teach you something. The same thing is happening to you now that happens to most people: they don't fix their attention. We move like automatons. That is a mistake. There must be reflection. When you hear some new theory, don't say: False! Think that there are thousands who have thought about it before you. But, at the same time, don't say: the Gospel! There is only one gospel: love God and your neighbor. If you pay attention--and don't think that all these theories are mine--they are St. Augustine's--you will without fail discover something very important: harmony. You will realize that there is harmony in everything, that everything forms part of a harmonious whole. Those very events that at first sight seem startling, you will come to understand as logical, as contributing to something harmonious and great. You will find harmony in the smallest details. This will assist you in no end in ordering your daily life. Your spirit will feel itself strengthened by forming part of that harmonious whole." Gironella, pp. 415-16 (emphasis added). Don't waste energy on things that generate worry, anxiety and anguish. Lift up your spirit and love God. Confession) is itself a mortal sin --- a mortal sin of Sacrilege." So writes Fr. Stefano Manelli. What is there to say about the great purity of soul with which the saints approached to receive the bread of Angels? We know that they had a great delicacy of conscience which was truly angelic. Aware of their own misery, they tried to present themselves to Jesus "holy and immaculate," (Eph. 1:4) repeating with the Republican , "O God, be merciful to me a sinner" (Luke 18:13), and having recourse with great care to the cleansing of Confession. When I received the book, which Mr. Foley helped me obtain in the United States and a big mahalo to him for that, I was determined to read the book with an open mind. Prior to learning of this particular book, there were times I believed in the apparitions I say that because, although I have never felt any draw to the Gospa's appearances there, I personally knew many people, including a priest who is very orthodox when it comes to church teachings, and friends who were brought back to the fold because of Medjugorje. All of these people "reverted" back to the Catholic faith because of Medjugorje. Even my own dear mom was a devotee of these apparitions and every since the 80's, she was determined to bring one of my brothers there to help his conversion. So you see, I had no reason to doubt the apparitions. Yet I didn't believe wholeheartedly. Donal Foley's book is written in a matter of fact way. He was not a harsh critic nor did he condemn the apparitions. He laid out the facts for the reader step-by-step. The followers and supporters have certain arguments as to why they believe these apparitions to be genuine. Mr. Foley counters each one of these arguments with logical explanations and questions. Another way of presenting the argument against these apparitions was by comparing Mary's messages and the behavior of these visionaries to a true and church approved apparition such as that of Fatima and the seers there, the little shepherd children. The book Understanding Medjugorge is highly recommended reading. Recently a friend emailed me a lovely powerpoint presentation of Mother Teresa. It was full of her beautiful and thought provoking quotes. If you would like to see it, please feel free to emai me and I will be glad to send it to you. Which brings me to a wonderful movie my family and I watched tonight. 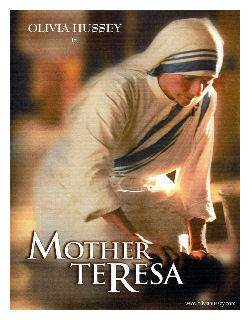 It was a story on the life of Mother Teresa starting from her life as a schoolteacher in India to the end of her life. She is portrayed in the movie by actress Olivia Hussey. Some of you may remember her as the Mother of Jesus in the movie Jesus of Nazareth. Ms. Hussey does an incredible job of bringing Mother Teresa to life for us. She somehow captured Mother's mannerisms and with a little help of make-up, she looked a little like dear Mother Teresa...but not quite. My family strongly recommends that if you have an opportunity to watch this movie, do so with your entire family. The only fault we found with the movie was the it went along very well from beginning, capturing the viewers attention. However, during the end, it is rushed to conclude. Still , worthwhile to see.